Putting a person on the moon is arguably humanity's greatest achievement — the single moment that embodies just how far we've come as a species. With that in mind, a film about the first moon landing doesn't need to be flashy or showy — the basic facts are amazing enough. First Man takes a gritty, realistic approach to telling the story of how Neil Armstrong (Ryan Gosling) ended up on the moon. This biopic traces about nine years in the astronaut's life, starting with his time as a test pilot and following him through the Gemini and Apollo missions. Rather than showcasing the glitz and beauty of these early space explorations, director Damien Chazelle instead highlights the visceral, white-knuckle terror of leaving the planet while relying on technology more rudimentary than a modern phone. Tense moments in space are often filmed close up in the cockpit, with lots of rattling and nausea-inducing spins. When Armstrong finds himself orbiting Earth in a spacecraft that's tumbling end-over-end, the audience gets dizzy right along with him. Just as important as the outer-space action is the earthbound drama, as First Man highlights the incredible sacrifice it took to get to the moon. One of the first scenes shows Armstrong losing a child to cancer, and multiple friends die along the way in accidents at NASA. 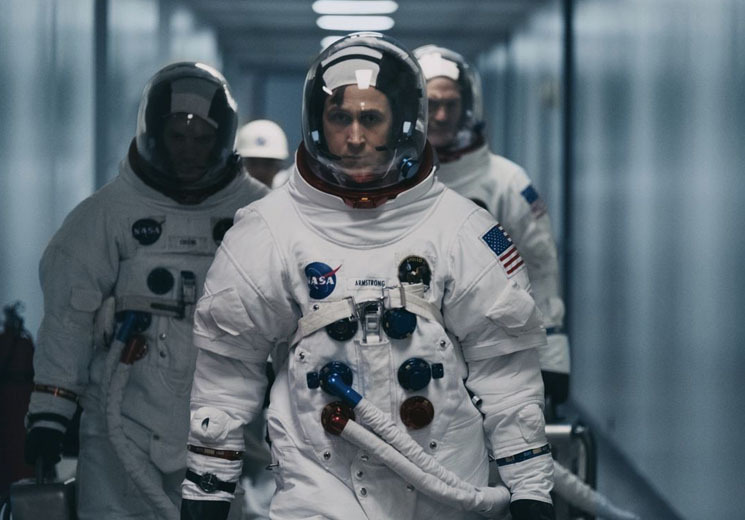 All of this takes place against a backdrop of marital conflict and political protesting, making First Man a slow and often bleak journey. Claire Foy is brilliantly multifaceted as Armstrong's wife Janet: she conveys the helplessness of not knowing whether her spouse will return home safely, but also captures the character's strength and personal agency. As for Gosling, he basically reprises his role in Driver: cool under pressure, emotionally withdrawn and simmering with a quiet sadness and tenderness. It's an understated role that he does well. Corey Stoll plays Buzz Aldrin as the loud-mouthed counterpoint to Armstrong's reticence, while Kyle Chandler brings his signature gravity to the role of NASA chief Deke Slayton. It's tempting to wish that First Man would get to its inevitable climax sooner, since much of the film is just a waiting game until that big lunar payoff. Still, the delayed gratification makes the ending all the more thrilling. The moon scene is truly jaw-dropping, and brilliantly captures the gravity — no pun intended — of that world-changing moment. Given that humanity doesn't seem particularly close to landing on Mars, it's likely that visiting the moon will continue to stand as our species' most awe-inspiring achievement for some time. As a film about the human toll of that accomplishment, First Man is up to the lofty task.